This game-changing, intrepid documentary has hit the mainstream showing us that Animal Agriculture is the the biggest cause of environmental destruction - producing 18% of the world's greenhouse gases. In contrast,transportation produces 13%. Never have I seen a documentary cause such a shift in lifestyle from close friends. It has become an essential environmental movie going viral since its release and is currently experiencing another surge of viewings this month as thousands go vegan in January for Veganary. Today, veganism is being considered by a totally new audience. Surprisingly, evenCalifornia’s Arnold Schwarzenegger encourages us to cut back on meat consumption to halt climate change. But why won't environmental organisations or government officials say anything? They tell us to limit hose-pipe use, recycle and take short showers, but rarely a mention of our diet. Director Kip Andersen seeks out the answer, taking us on a sometimes humorous, but always well-informed, journey as his suspicions grow and evolve over this deafening silence. Unlocking door after door, Kip finds a web of meat manufacturers, industry bodies, government and other influential folk dictating the official narrative. He shares with us the trials, tribulations and dangers of making, and getting funding, for a documentary which addresses such a controversial topic. After all, the meat and dairy industry is one of the world’s biggest money making machines. As Kip - brought up a ‘normal’ American - skims off the layers, we watch as his own attitude and lifestyle changes. 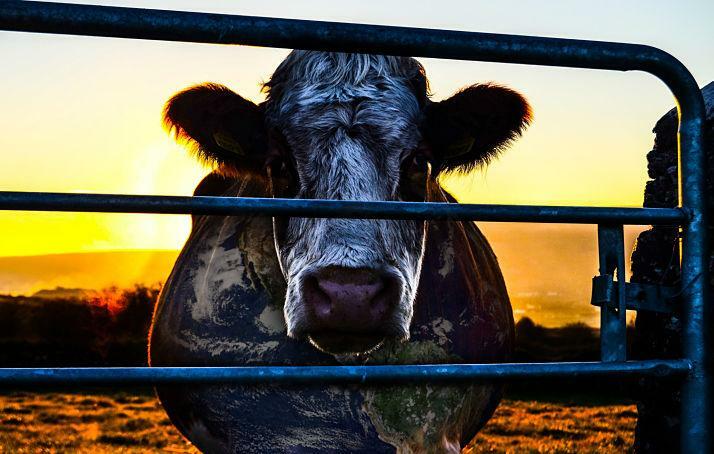 The film has reached so many as it is a first in fully describing the multi-faceted destruction animal agriculture reeks onto our water resources, atmosphere, oceans, wild habitats as well as its serious health and ethical considerations. The stats are mind-blowing. We’re told eating one beef burger is the equivalent of showering for 2 months! Why? Incredibly water intensive grain is used to feed livestock, with the animals themselves being major water consumers. Altogether, animal agriculture uses around 30% of the world’s fresh water, while countries, both developed and developing, suffer horrendous droughts. As we divert 50% of grains and legumes grown worldwide away from people, some of which are starving, to feed to animals, we have created an energy consumption machine putting us all, and the planet, at risk. I was staggered to learn that there are 70 billion livestock animals on the planet. Just the cows alone produce 130 times more waste than the human population! This effluent goes into our oceans creating nitrogen flooded dead zones (areas devoid of life). Weirdly, a topic ocean conservation organisations seem to avoid (see Seaspiracy) Kip investigates ‘sustainable meat’. After visiting a ‘sustainable’ livestock farm on the Californian coast, he learns that if all of the USA continue eating the quantities of meat they do today, but all that meat was ‘sustainable’, it would require 3.7 billion acres of land – this means all the land in the USA, Central America, lower parts of Canada and top parts of South America would need to be cleared for agriculture. On the ‘sustainable’ farm we witness the farmer’s children forming strong bonds with their pigs. We are given a stark reminder that meat is another living being when one of the children declares a pig “could be like your best friend.” The big turning point for Kip is watching a duck being slaughtered – he tells us if he can’t do it himself, he can’t pay someone else to do it. We are all invited to ponder the disconnect that when we eat meat, we are eating a living, breathing being. Through eye-opening interviews, scientific and social exploration, Andersen does a great job of presenting the facts in a meaningful way. The facts and figures are presented through clever visuals, graphs and cartoons. An interviewee’s line rings very true when he tells us that you can’t be an environmentalist and eat animal products. Even some of the biggest meat eaters I have known have watched this film and made significant changes to their diets. The reach and support of this film has been substantial, and it is now available on Netflix after Leonardo di Caprio produced a new cut! It does the job in increasing the general public's’ awareness of the impacts we can have by simply reducing our reliance on animal products. We are left with hope that it’s not too late. The powerful message Kip hands us is that it is not just about the sustainability of our planet, but thrive-ability - we can live happier and healthier lives on less meat. Vanessa A. Sturman - inquisitive, compassionate and vegan. Originally from Bristol and now living in London. Studied both biological and social anthropology at the University of Cambridge, with a focus on reproductive ecology. She has worked in environmental consultancy and now works in project management and stakeholder engagement. Both a buddhist and vegan, her aim is to continue raising her own consciousness, and that of others, in terms of what we consume and our day to day choices and actions.